Science Applications International Corporation (SAIC) is a US defense contracting company headquartered in Tysons Corner, Fairfax County, Virginia. Originally founded in 1969, the company grew to the point that in 2013 the name was changed to Leidos, and the current incarnation of SAIC emerged as a spin-off (making the current SAIC a spin-off from the original SAIC, in an interesting twist of fate). 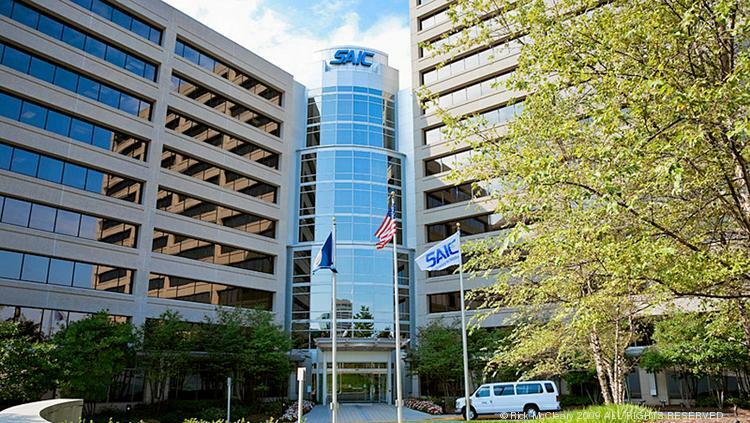 The flag of SAIC can be seen in photographs of the company's Tysons Corner headquarters, particularly at http://media.bizj.us/view/img/356011/saic-headquarters1*750xx918-518-0-0.jpg. The flag features the SAIC logo in light blue centered on a white field, with the motto "From Science to Solutions" beneath the logo.